With the digitization of the casino, the casino gaming development companies have made considerable efforts to attract more players by making interesting variations of different games. Many users are tired of playing the standard variations of the games. Therefore, it is better to play games that are tweaked and the developers have added certain elements to increase entertainment. The game of blackjack is one such game that has seen the addition of many popular variants in addition to the classic blackjack game. Popularly known as “21”, blackjack is one of the oldest card games that have come a long way since it was invented in the 15th century. Over the time, multiple variations of the game came out in different geographical locations and casino game developers developed different titles out of these variations. Some of the popular blackjack variations are double Attack, Vegas, Blackjack Switch, Super Fun 21, Double Exposure, Blackjack Atlantic City, etc. bCasino is one of the most favorite places for the casino players of the United Kingdom to play Blackjack Atlantic City multi-hand online. The casino offers a delightful casino gaming experience to players with up to date software, professional customer support, and easy payment options. At bCasino, players are prioritized and it is our commitment that all the features of the casino are in line with the customers. bCasino has gained a reputation as the best uk online casino because of its vast collection of games and glitch-free casino gaming experience offered to the players. Developed by NextGen Gaming that is popular for its exciting slot and card games titles, Blackjack Atlantic City MH is a game that is based on the standard blackjack game but the game allows the players to play three different hands of blackjack at the same time with the dealer’s single hand in the opposition. NextGen Gaming has left no stone unturned to make this game more exciting than the other variants of the blackjack. You can see their efforts in the clear and realistic graphics of the game, interesting background music which instantly creates an atmosphere of casino gaming, and the self-explanatory buttons that make casino gaming easy even for the novice players. The game has a certain charm that attracts you to it and has the capability to keep you hooked for the hours. Players who love the fast-paced games will definitely enjoy Blackjack Atlantic City MH developed by NextGen Gaming. It is the specialty of the games developed by NextGen Gaming that they feature rich graphics and the background music is chosen in a Manner that makes it fitting for the game. Blackjack Atlantic City MH is no exception. Talking about the user interface, it begins with the logo of the game and the game development company while the game loads. If the game does not load in the first time, try turning on the flash player in your browser. When the game loads, you will see that the major portion of the interface has been painted in the green color and the setting is similar to a brick and mortar casino. On the top left side of the screen, you will see the minimum and maximum bets as 1 and 100 respectively. Below it is a button to view all the rules of the game. 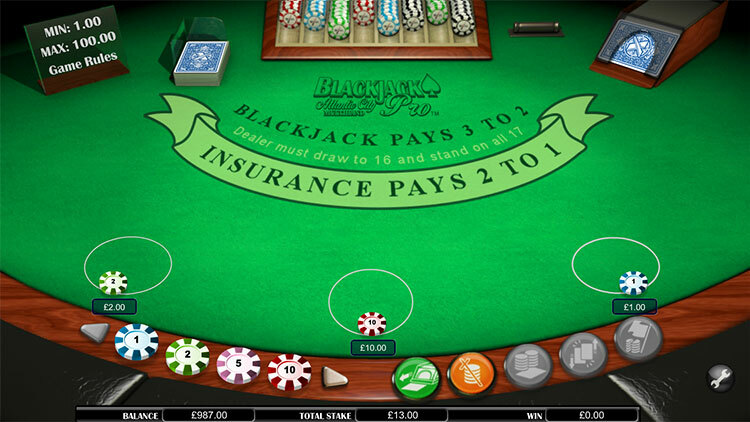 At the center of the screen are some basic payout related rules such as “Blackjack Pays 3 to 2”, Dealer Must Draw to 16 and stand on all 17” and “Insurance Pays 2 to 1”. There are three ‘bet here’ buttons that can be used for placing the bets in the game. On the bottom part of the screen, you will find the chips for placing the wager. The chips are in the denominations of 1, 2, 5, and 10. AT the very bottom of the screen, is a counter that displays balance, total stake and the amount won by a player so far. On the bottom right side, a wrench like symbol exists. Clicking on this symbol opens the option to modify the game related settings. You can modify Game Speed, Audio, Color, and Language using this option. It would not be wrong to say that the game interface is pretty smart and intuitively designed for the players. Even a player with the basic minimum knowledge about the game of blackjack can easily grasp the gameplay in the game. 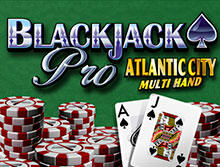 Blackjack Atlantic City multi-hand is based on the standard rules of the classic blackjack game with some modifications. The main aim of the game is to reach the value of 21 before the dealer. However, if you happen to exceed the value of 21, you will lose your bet in the process. The game is played with the 8 deck of playing cards. Jokers are not included in the deck of the cards used in this variant of the blackjack. All the cards are shuffled at beginning of each round thus making it impossible for the players and dealers to count the cards. This is a multi-hand game; therefore, players are allowed to play up to three hands. If both dealer and the player scores 21, the player’s bet is considered as a superior. All the face cards carry the value as 10. The value of aces depends on the advantage to the player and can hold the value between 1 and 10. The cards numbered between 2 and 10 carry their own face value. How to Play the Blackjack Atlantic City MH? In Blackjack Atlantic City MH by NextGen Gaming, two initial cards are dealt to each active hand and to the dealer as well. Out of the two cards received by the dealer, one card is face up while the other card is face down. The players can see the face up card. The highest payout in the game is set at 300 coins and therefore it is a game ideal for players having a low bankroll. You can adopt different strategies and some basic tips that can help you win the game easily. The game also offers some features such as double down, splitting and insurance bets to help players win the game. The player will win if the total value of the cards is 21. Another way to win the game is if the dealer exceeds the value of 21 during the game. If the total of your card exceeds 21, you will be busted. Upon getting busted, you will automatically lose your bet. Blackjack in the game pays 3 to 2. A winning hand pays 1 to 1 and Insurance pays 2 to 1. There are different play options in the game. We have explained some of the play options you will come across in the game. A Split is allowed when the first two cards dealt to the player have the same value. When a split is performed, a bet equal to your initial bet is placed. Players are allowed to split a hand only once and when an ace is split, only one card is dealt to each ace. If a card holding its value as 10 is dealt to either ace, the hand will be considered as 21 and not a blackjack. Players are allowed to double down the bet on any hand before beginning the betting for that particular hand. During a double down, a bet equal to your original bet is placed on the hand. Only one additional card can be provided when a double down is performed on a hand. The game allows the double down on the split hands. Out of the two cards dealt to the dealer, one card is face up. If this face up card is an ace, players can be allowed to place an insurance bet. Surrender is allowed on any hand irrespective of the value. You can use the Surrender feature after initial cards are dealt and before a player starts playing on each hand. Blackjack Atlantic City MH is an interesting variation of the blackjack game that is popular in the Atlantic City. Players can play up to three hands which increases the level of difficulty in the game as players are required to apply extra strategies for it. It is a game with excellent graphics and players can enjoy a glitch-free gaming experience while playing at bCasino.